Ignoring the beautifully stocked ordering desk and well-arranged Furniture will leave one with yet another empty shop waiting to be rented out to any ready buyer, but this wasn’t the case on the 14th of January when I went into one of the branches of cafe neo- a cafe whose major aspiration is to be the brand across Africa that provides a ‘third space’, where customers can escape, meet like-minded dreamers and create great things. It’s of course still on my mission of exposing the tourism potentials of every country on planet earth. 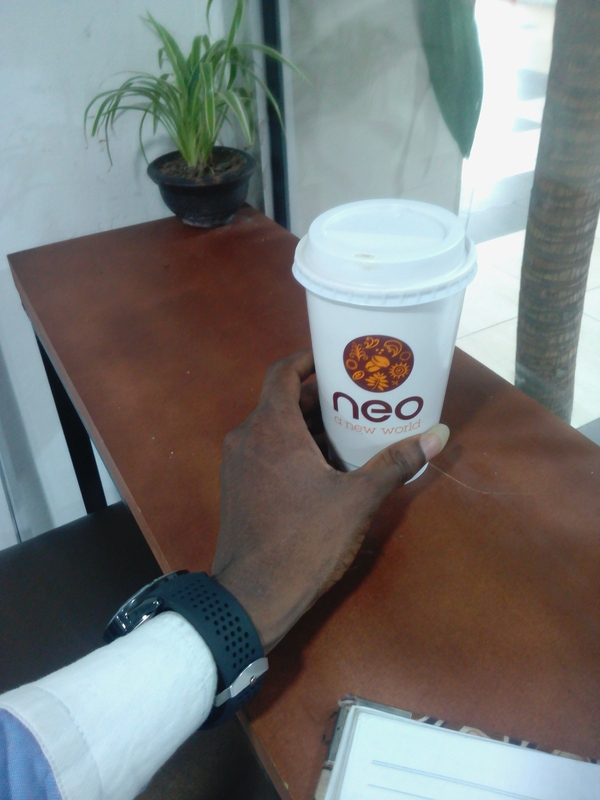 On this particular mission, I aimed at objectively reviewing café neo (Yaba). Let me quickly run you through my findings so that I can go pack my bag for my next trip to Ilorin. 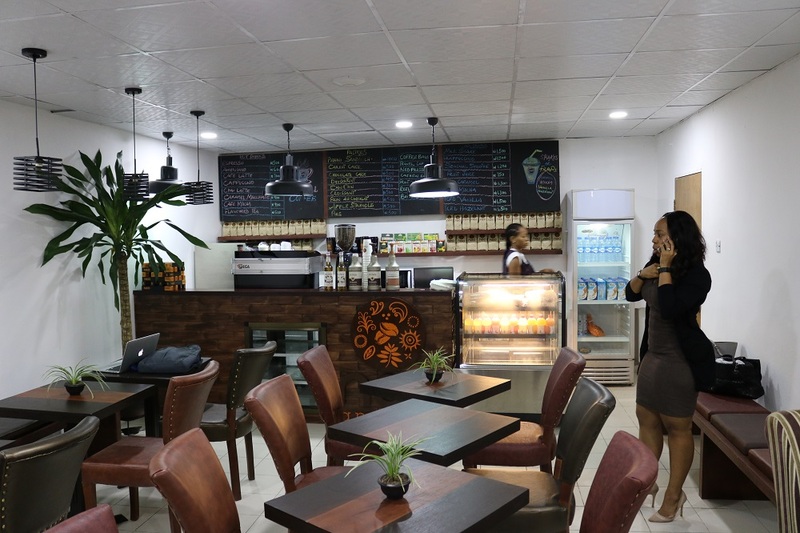 This particular branch of café neo sits calmly on the First floor of e-centre Sabo Yaba (popularly called ozone), right in front of trend express. Due to my dislike for grammars, natural, simple, tidy and comfortable will be used to describe this classic destination till i find better substitutes. The cordial relationship between the natural vegetation and lighting contributed more to it’s absolutely stunning 30-seater interior. You would have done over half an hour before noticing the soft voice pouring out of a strategically placed speaker close to the ordering desk. only the gods can tell how they manage to know the kind of music that sits well with all and sundry. I settled down for few seconds to study the menu chalk-board before walking towards the only staff on duty (I’d talk about him soon) to request for a cup of hot cappuccino with a pack of lightly salted cashew nuts, both of which I instantly paid for according to their custom. Embedded inside this cup is the best coffee I have ever taken. I saw some nicely arranged snacks on display but I refrained from ordering any due to my slim pocket (I’m yet to forgive myself sha). For the quality of products and services, I can tell you for free that their prices are worth it. A notice on the ordering table indicated they recently increased their prices- no thanks to our naira whose love for skydiving is second to none. Yeah! I have been hastening up just to get here. What they do is tell you to go have your sit after you must have placed your order. And within 5 minutes, you’d be called upon using the name of the drink you ordered. I personally loved the way the machine screeched while my coffee was being made. The best which I reserved for the last was the liveliness which oozed from the smartly dressed attendant who made my coffee. You would know from his outlook. He was simply amazing to not just me but everyone present. Did I mention that I loved his dreads? – People who are in search of a comfortable meeting place. – Lovers who need a touch of nature for their next date. I met someone who to me was the best speaker at the HGAS 2016- Mr Oluyomi Ojo– a young, handsome and outspoken dude who captains the ship of Printivo. Don’t ask me how my conversation with this friendly CEO went but all I can tell you is that I went back home with words of tangible advice and a surprising follow back on twitter! Distractions: this specifically comes from people having meeting. Though not all of them are as loud as the ones I saw. Charging cables on the floor: yeah, they made the nicely tiled floor look unsafe. You can imagine what falling face flat with a cup of hot coffee will look like. How about when you are adorned in a white costume? Don’t even try. Slow internet: this is the most frustrating- both their wifi and yours will suddenly become slow. I think I finally found something slower than Chelsea’s Mikel. A second class upper isn’t at all a bad grade for a student with great prospect as café neo Yaba. I’d want to go back though. If not for anything, at least for the comfort and service. -Shortcoming(s) automatically attract(s) a ‘D’. Is there a destination you want me to review, feel free to reach me ASAP. … Don’t go just yet naw. Please kindly help us share this post. It won’t take more than 5 seconds. You won’t be disappointed Bamidele. Please come back to share your testimony after your experience. I’d advise you try it out.